Alright. It was irresponsible of me to include the above quote, not knowing the source. However, I lifted it from a display inside the hotel’s museum. I see no reason why anyone would make up something like that, and it sounds something Bill would say, so there you go. John Alexander Somerville, born in Jamaica in 1882, came to the U.S. around the turn of the last century. He graduated from USC’s dentistry program as the school’s first black graduate, then became the first black man to pass California’s State Dental Board. (Later on, his wife, Pomona-born Vada Watson Jetmore Somerville, whom he married in 1912, became USC’s first female black graduate and California’s first black female dentist.) 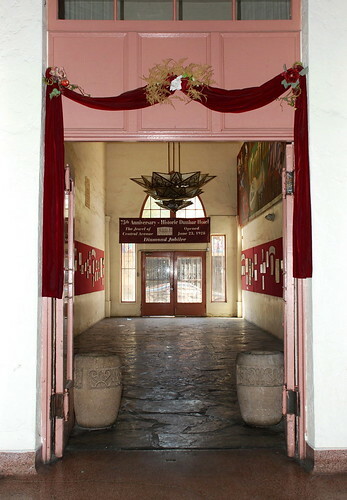 Somerville began his profession in a pair of rented rooms at Fourth and Broadway. In 1913, he co-organized the Los Angeles branch of the NAACP. The black and white postcard above is from USC's Digital Archive. In the 1927, fed up with Jim Crow and segregation laws, Somerville successfully built a 26-unit apartment building, the La Vada, at Vernon and Central. Every unit was rented and the complex paid off. 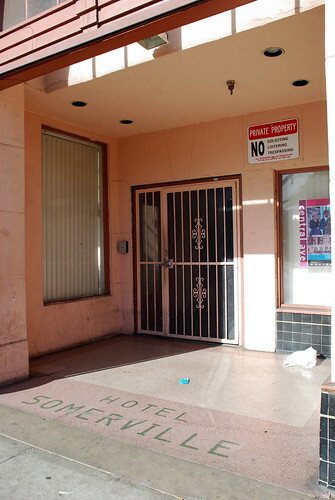 Encouraged by the success of the La Vada, Dr Somerville managed a loan of $100,000 to go toward a new project, a first-class hotel to serve L.A.’s black visitors. “The Pullman Company had hundreds of colored employees coming to Los Angeles daily,” he wrote in his autobiography. 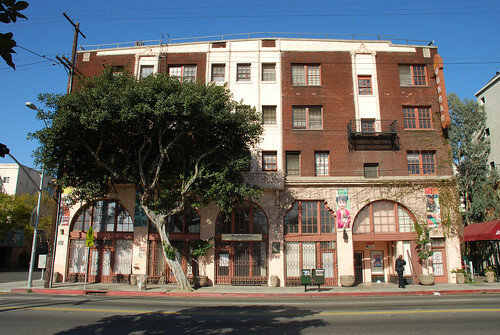 “Most of these men, many of whom came from fine homes, had to sleep in the cars at the station because they could not find sleeping quarters during their stay here.” The Hotel Somerville was completed in June 1928 as “the finest hotel in America catering to colored people.” Located at the corner of 41st Place and South Central Avenue, the building was actually about thirty blocks south of the then center of the black community at 12th and Central. 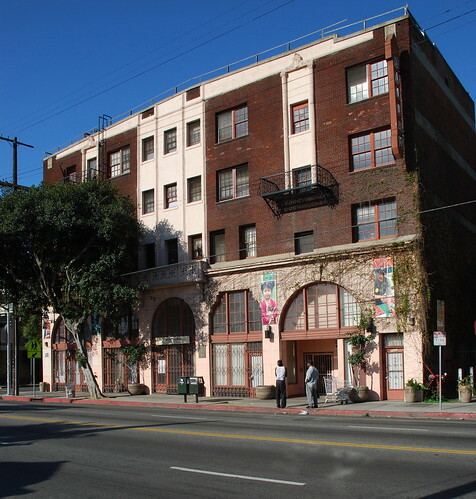 However, with the success of the Hotel Somerville, it was only a matter of months before the surrounding vacant lots were bought up with new buildings sprouting almost overnight. More than 5,000 people stopped by the four-story hotel opening day. 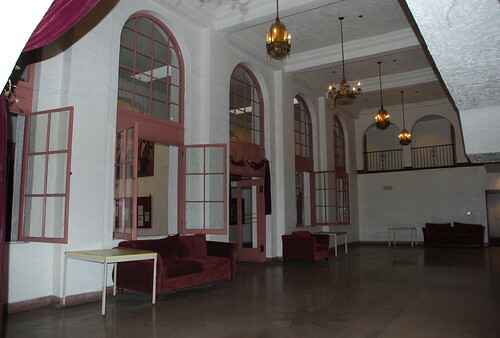 Visitors were met with a ground floor that contained stores, a barbershop, a beauty parlor, and a flower shop. 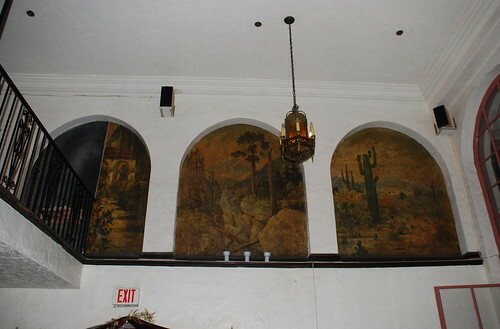 The Somerville’s dining room, managed by Fannie Burdette (one of my favorite names, ever), could hold 100 diners and featured a balcony for an orchestra. 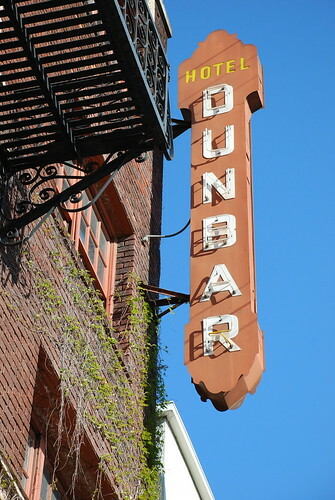 While the Hotel Somerville lettering above dates from the late 1980s restoration, the Dunbar sign below is pure 1930s. 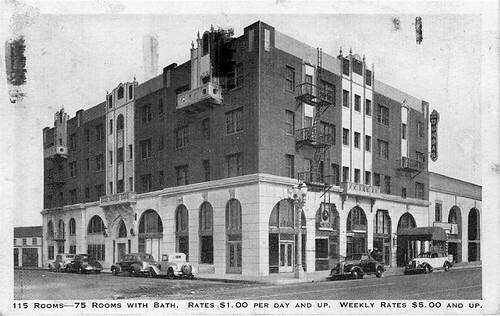 Just after opening, the hotel, with its more-than-100 rooms, hosted the west coast’s first NAACP convention. Guests included Lincoln Steffens, Mary White Ovington, Arthur Spingarn, James Weldon Johnson, William Pickens, Charles W. Chestnut, and DuBois. The following year’s stock market crash hit Somerville hard, and he would lose the La Vada and sell the hotel to gangster Lucius Lomax. Lomax renamed the Somerville the Dunbar in honor of the poet, Paul Laurence Dunbar. 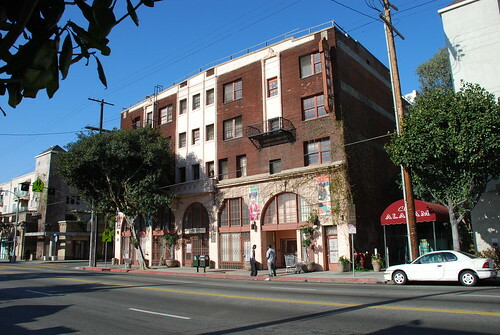 Lomax sold the hotel in 1934 to Father Divine’s (aka George Baker’s) Peace Mission Movement. The Nelson family took ownership by the late 1930s. By the late 1920s, Central Avenue had become the “52nd Street of the West”, also drawing comparisons to Harlem’s 125th Street. 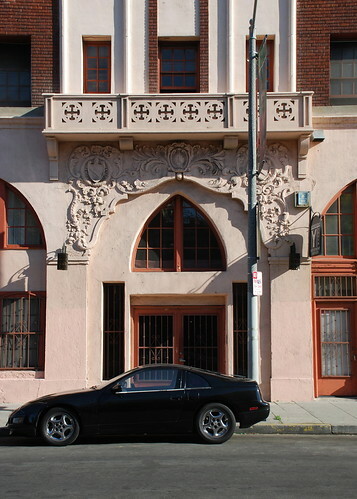 The Dunbar was the major stopping place in L.A. for black entertainers, athletes, and writers. Guests included Duke Ellington, Count Basie, Bill “Bojangles” Robinson, Lena Horne, Eddie “Rochester” Anderson, Langston Hughes, Art Tatum, Cab Calloway, and on and on. I sure would love to get a glimpse of any old Dunbar registers. Although you could hear live music in the hotel, like in the Turban Room bar, it didn’t hurt that one of the most happening clubs, the original Alabam, formerly the Apex, was right next door. Other clubs in the area included the Downbeat, the Memo, the Last Word, Dynamite Jackson’s, and lots more. I was confused by the 75th Anniversary sign above, until I realized it was from five years ago. That means 2008 marks the 5th Anniversary of the 75th Anniversary! 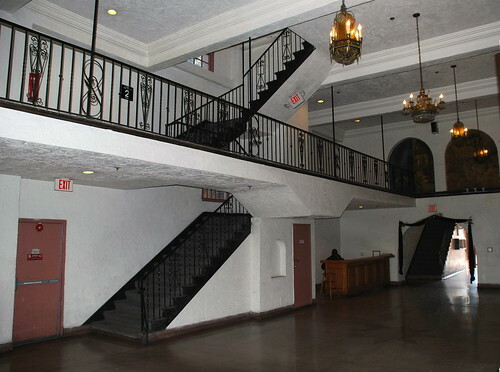 Bernard Johnson bought the hotel in the late 1960s with hopes of rehabilitating the structure and incorporating a museum. While the old Somerville was declared a city landmark in 1974, followed by its placement on the National Register of Historic Places in 1976, it wasn’t until 1988 when the non-profit Dunbar Economic Development Corporation was formed with the purpose of restoring the landmark. 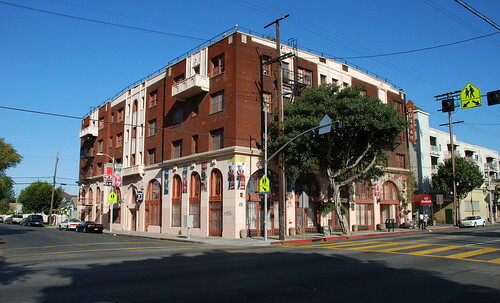 After a major rehabilitation, the Dunbar Hotel Apartments opened in 1989 with 73 low-income apartments, four commercial spaces, a museum, and senior center. For a detailed report on the late eighties restoration, see this relative section in Affordable Housing through Historic Preservation. And click here to see adodom’s five-minute video tour of the Dunbar. Don’t underestimate the importance of this building. During the Jazz Age and Depression, the Somerville/Dunbar played a major part in marking Los Angeles as the place where many African-Americans believed they could live better than anywhere else in the country. I’m not going to lie and say this is an area you want to sight-see around late at night, but I was there early Easter morning and was greeted by passersby, at least one friendly shopkeeper, and the Dunbar’s helpful security guard. 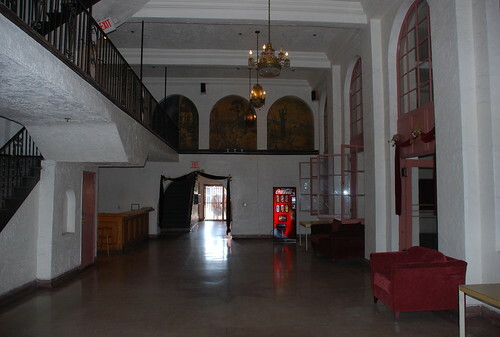 And while any glimmer of Central Avenue’s glory days of 75 years ago are long gone, standing inside the hotel itself, it’s hard not to get the smallest sense of what it was like when the Dunbar was the center of life for so many people. I love the story of the Dunbar. I'm familiar with Jack Kelson's book. He lives in Altadena, nice guy. I personally, was intrigued by the graphics of the differing hotel's menus and brochures. The city of L.A. is currently building a new city hall in that area. It's going to be "green". When I was there a few years back, I got a tour from an elderly man who was ready to celebrate his 100th birthday. I hope he lived to see it. My blog is down right now. It will be up soon. I'm currently tinkering on it with a new take on the color brown. Beautiful property. Too bad it is being foreclosed on! !